It’s Time D-Heads! 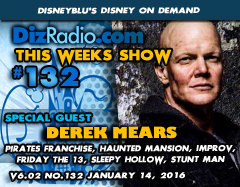 This week we set sail into January, steer clear of Sleepy Hollow, watch out for Pirates and Zombies, and laugh with Improv as we welcome DEREK MEARS (Pirates of the Caribbean, Dead Man’s Chest, On Stranger Tides, Friday the 13th, Predators, Haunted Mansion, Sleepy Hollow, Improv, Comedian, Stunt Man) to the show! Derek stops in and discusses his career, working on the Pirate films, Improv, Comedy, doing Stunts, having Action Figures and more! In addition we have the D-Team back kicking it off with Erin answering your questions in I Want To Know and we have Jason giving you a Blu-Ray and DVD that we must add to your collection in The Vault. Nathan looks backwards at This Week in Disney History and Paige sets sail into the musical realm with the Magical Music Review. And our Newest D-Team Cody stops in with the Hollywood Walk. There is news hot off the D-Wire with news about Disney Parks, the Magic Kingdom, the Moms Park Panel, Music, Lauren Conrad, Minnie Mouse, Brian Bedford, Robin Hood, Star Wars Blasters, Jesse, Soundtracks, New Releases, Attractions, The Disney Channel, Toys, and Discounts!